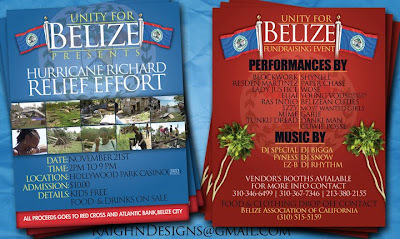 Unity for Belize is a group that has come together to help our people at home in Belize. 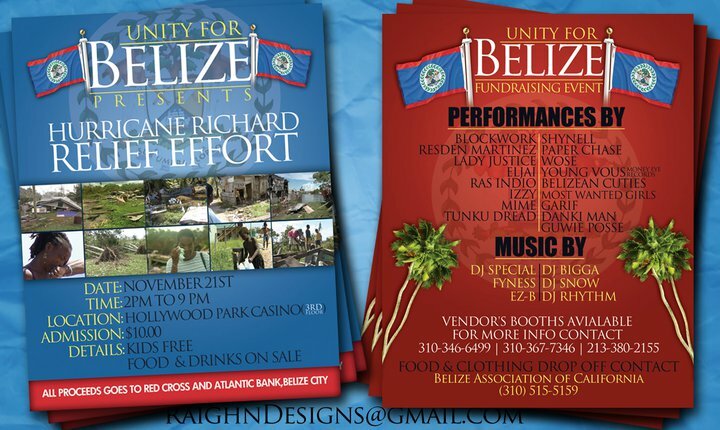 Many of you are aware that on October 24th, 2010 Hurricane Richard hit Belize. Many of our people are without clothes, food, or a home. As a group we have decided to come together as one with the help of our Belizean Community in Los Angeles. Our plan is raise money to send back to Belize through Belize Atlantic Bank. We are putting together a Concert with local Belizean artist and dancers. Everyone who has decided to participate is donating their time. Our line-up includes popular Belizean artists and entertainers in the Los Angeles area like: Danki Man, Mime, Ras Indio, Garif, Resden Martinez, Blockwork, Isabell Izzy Requena, Lady Justice, Paper Chase, Young Voues, and Wose (American underground Artist). There will also be drummers to help us celebrate Garifuna Settlement Day. Tunka Dread and the Guwie Posse have taken the time to help us with this celebration. We have the Belizean Cuties and Most Wanted Girls to give us their presentation with a dance or two. The event will be filled with entertainment for the entire family. We look forward to seeing our families and friends coming together to help us to make this fundraiser a success for our families and friends back home in Belize.